FEATURES: • Stainless steel body covers flanges up to 2.875” in diameter. • PUSH PULL® stopper has excellent clearance for high-flow dainage and does not require crossbars in old strainer body. 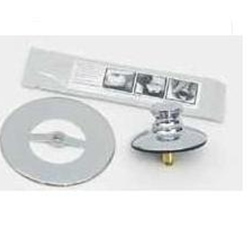 • Easily and quickly installs over previous strainer bodies, requiring only the provided silicone adhesive. Best if not used for 24 hours after installation. • No extension into the drain so it is not limited by inside diameter of strainer body.